As early as 600 AD, ancient Mayan civilizations recognized the benefit of tooth replacement and were finding ways to replace missing teeth. Archaeologists discovered the skull of a young Mayan woman who had pieces of shell shaped to resemble a tooth in her mouth. Other skulls revealed that both shells and jade had been used to replace missing teeth. Some of these first implants actually fused to the jawbone. During an archaeological dig in Honduras in the 1930's, Dr. Wilson Popenoe made similar discoveries in ancient Egyptian Artifacts when he discovered skulls with shells and ivory shaped into teeth. Decades later, the modern world began to catch up. In 1951 at a quiet town in Sweden at the University of Lund, Professor Peringvar Branemark, an orthopedic surgeon, made the first big strides toward oral implantology (dental implant procedures). Dr, Branemark and his ream of researchers were studying the healing process of bones. His team placed titanium rods into the thighs of rabbits. As serendipity would have it, Dr. Branemark's team discovered that it was impossible to recover any of the bone-anchored titanium rods to see how the bone had healed. The titanium had bonded irreversibly to the living bone tissue. It did not take them long to see the enormous potential in this technique. Wanting to continue to study this process, Dr. Branemark decided that it would be much easier to observe the healing process in the mouth. During this process, he discovered that titanium screws could be used as bone anchors for teeth. The research came to discover that titanium (a very strong and non-corrosive metal) was the only consistently successful material for dental implants. He named this procedure osseointegration. After three decades of study, fellow scientist continued to be skeptical so Branemark conducted numerous tests, both on animals and humans, before publishing his research in 1981. The paper was presented at the Toronto Conference in Clinical Dentistry in 1982. As the paper was carefully scrutinized, medical confidence grew in this procedure and guidelines for dental implant logy were set. This procedure was first introduced to people who had lost all of their teeth and had difficulty stabilizing or tolerating dentures because of loss of jawbone needed for stabilizing. Even then it was well known that tooth root implants worked best in the dense jawbone generally found in the front part of the lower jaw. The first dental prosthetic implants were a one-size fits all design. They were the same width with only the length being variable. Original surfaces were machine smoothed and polished. 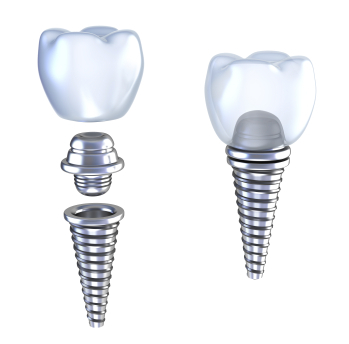 Modern day implants come in a variety of shapes and sized to suit different teeth that need to be replaced. The surfaces of dental implants have been improved to enhance the Osseo integration process. Implants are no longer smoothed by machines. They are sandblasted to roughen the surface and acid etching is used to increase the surface area to which bone can attach. Over the next two decades, technology has continue to grow. Slight modifications in titanium have improved healing time. Procedures have become quicker, easier, and less painful. Today dental implants have a 98% success rate with proper care.